"I know this is going to sound like a strange description," said Kate as she inhaled deeply on her shisha pipe. "But it's almost the equivalent of being on your own and getting into a lovely fragrant bubble bath." She's a devotee of shisha, the Arabic water-pipe in which fruit-scented tobacco is burnt using coal, passed through an ornate water vessel and inhaled through a hose. It seems shisha is crossing the historic racial divide in the town between Asians, who often don't drink for faith reasons, and whites. "For myself, I know I'll lose a place that I can go out with my Asian friends who I can't go out to the pub with," Kate said of the impending ban. That's led to a last-ditch legal battle to exempt shisha from the ban, being waged from an office above Shishawi, one of the country's biggest shisha lounges in London's Edgware Road. With neon strip lights, a 24-hour licence and a vast cinema screen playing Lebanese pop videos, Shishawi is the mother-ship of shisha cafes. There I met the charismatic leader of the campaign, Ibrahim Nour. Nour, a former lawyer, bypassed the fruity shisha flavours and ordered a stronger, traditional pipe - one with less scent and more tobacco. "Of course I have a bigger moustache, so to maintain it you have to smoke the tougher one," he joked. "If you look at the impact of taking the shisha out of this culture, you're talking about disrupting and destroying the whole pattern of community activity." He believes the government didn't consult adequately with the shisha-smoking community, but ministers say they had time to respond as part of the national consultation. And the decision is based on advice from the World Health Organisation, which insists shisha can be as damaging as other forms of smoking. 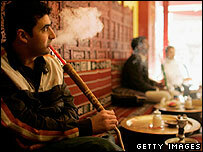 Despite being a recent addition to British culture, shisha has a long history. Many believe that it originated in India (known there as "hookah") about a thousand years ago, when more often the shisha pipe was used to smoke opium rather than tobacco. The government's argument that it cannot allow a minority group to damage its health while the majority remains protected, has some Muslim support. Dr Azzam Tamimi, an Islamist campaigner said, on a recent visit to Shishawi cafe: "I am one of those who believe it is forbidden in Islam to smoke, because it is forbidden to harm yourself. Maybe this will make young people think of something better to do." 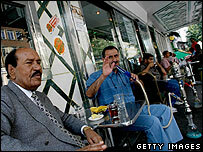 Go to BBC Asian Network's The Last Days of Shisha to hear the programme again. I have some very fond memories of my first shisha experience - in a small cafe in Dubai, passing the pipe around and sipping fresh strawberry juice while watching others play backgammon, read books, simply talk to one another... the idea that shisha cafes in the UK will have to close is a horrible thought. The reason many Muslims go to shisha bars is cos they don't want to be in a place where people are drinking alcohol - so it's sort of become a means of socializing without being at a pub/club... it's been seen as the less of two evils. Alcohol is strictly prohibited in Islam, but although anything harmful to health is also prohibited in Islam, the reason many Muslims give leeway to shisha smoking is because it hasn't been strictly singled-out and forbidden the way alcohol consumption has. I think if they let them stay open in NYC, why not the UK? I'm in total agreement with Nick from Cardiff, people actually go to shisha bars to smoke, whereas maybe people in pubs don't. It's like banning alcohol in pubs and clubs! It makes no sense. I think all establishments should be banned from smoking, effectively a blanket ban with no exceptions. 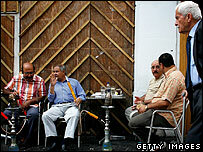 Smoking in a pub goes hand in hand, so smokers will just learn to go without and likewise for the shisha bars. They will have to sell something else :-) Times change, move on people. Last time I was in New York I went to a hookah bar, which are still allowed to operate despite the smoking ban that is in force there. There have been complaints from people living locally to the bars but at present they remain open. I've been a non-smoker for years, and will, personally, benefit from the ban on smoking in public places, especially restaurants. And, yet, I'm dead against the ban. I go to a lot of Moroccan/Arab restaurants and really like the smell of shisha, even though I rarely indulge. This law is another example of using a sledge-hammer to crack a nut. I've talked to the manager of a local shisha bar in London who's worried that he and some of his fellow-shisha-bar-owners will be put out of business by this nonsense. Laws that ban behaviour that some find anti-social like smoking are, inevitably, too black-and-white, and, more importantly, make us morally lazy - instead of learning to respect each other and to negotiate, banning eliminates the need for such relationship. How typical of this stubborn government to ride roughshod over the centuries old custom of minority ethnic groups. The smoking ban is an infringement of civil liberties, and it is becoming tiresomely familiar to see government steamroller its own views through parliament without engaging in democratic debate. This makes no sense - everyone who attends a shisha bar obviously goes there with the intention of smoking. There is no passive smoking involved (which is apparently what the ban is trying to stop) So why ban it? Work round the ban like the rest of us - put up a tent! Shisha is an excellent way to relax with friends. Who do the government think they are to kill off our culture? It seems that sitting in the houses of parliament all day has completely alienated them from the views of their public! This is not a war against drugs, it is a war against personal freedom! The shisha is not a British or English tradition and should it be exempted from the smoking ban I feel that many of middle England, even non smokers like myself, would see it as another slap in the face for the indigenous population. The shisha is just as harmful as cigarette smoking. A great shame. I will be puffing my last in public on a shisha at the New Sheridan's Last Gasper party on Saturday. I was under the impression that strictly speaking Muslims should not smoke. So how is this any different from going to the pub? As the end of the article points out, it's not an ancient tradition to smoke tobacco - the leaf arrived with Europeans from the New World. I have always been surprised how many Muslims smoke tobacco. Some friends hold hold a cigarette in the space between curled thumb and first finger. They place their lips on the skin round the hole and so do not `touch tobacco`. I have always seen this as an odd way of getting round the ban. The *tradition* of smoking shisha? Will the *tradition* of smoking cigarettes survive the smoking ban? Why is shisha better or worse than fags? Just coz it's trendy? You'll never stop people smoking tobacco as long as humans exist. But shisha is just as bad for you. I was giving serious consideration last year to starting a shisha bar and Middle Eastern Dance venue in my home city. Obviously the ban made me realise it just wasn't going to work. Bit disappointing but I guess I'll have to find something else to daydream about!